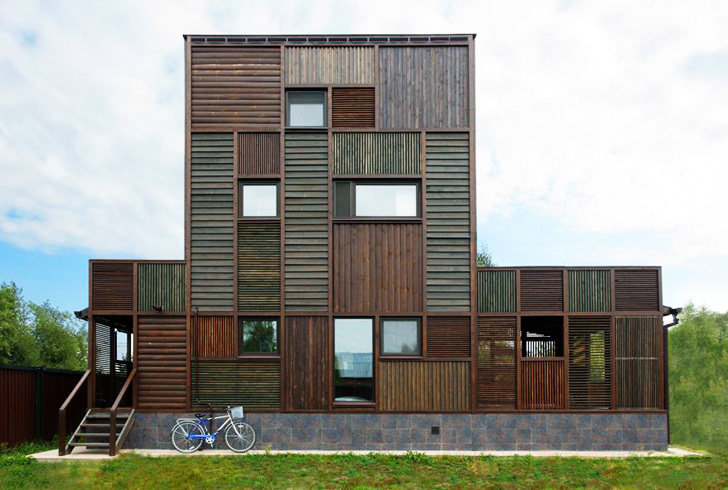 Peter Kostelov’s unusual Volga House is constructed from an elaborate slotted framework of wooden patchwork tiles. Emulating the traditional “dacha” year-round home, this Soviet-style structure is made up of fragments painted in varying shades of brown and arranged at different angles in order to regulate sunlight. Spotted over at Architizer, the interesting multi-layered structure combines traditional wooden overlapping planks with less conventional additions such as spade hafts and forged square timber. Each section of the project varies in size, shape, and color, creating the unusual aesthetic of a patchwork blanket. Dachas are traditionally constructed using any materials which happened to be available, so they tend to be unique structures that are highly personalized. Designed with the aim of providing a comfortable space for a family, Volga House includes a variety of verandas and a plot for a future summer cottage. 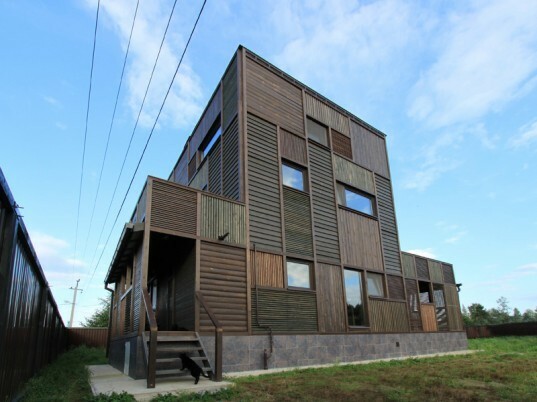 The project is nestled alongside the Volga River in Tverskaya, Russia where the weather tends to be cool, so the designers have integrated insulation panels made from squared timber. haha, and looks like he always misses some spots in between. I bet he plays Tetris. Dachas are traditionally constructed using any materials which happened to be available, so they tend to be unique structures that are highly personalized. Each section of the project varies in size, shape, and color, creating the unusual aesthetic of a patchwork blanket. Designed with the aim of providing a comfortable space for a family, Volga House includes a variety of verandas and a plot for a future summer cottage. The project is nestled alongside the Volga River in Tverskaya, Russia where the weather tends to be cool. The building integrates insulation panels made from squared timber. The interior of the home.